In the picture, you can see the different chess treatment. 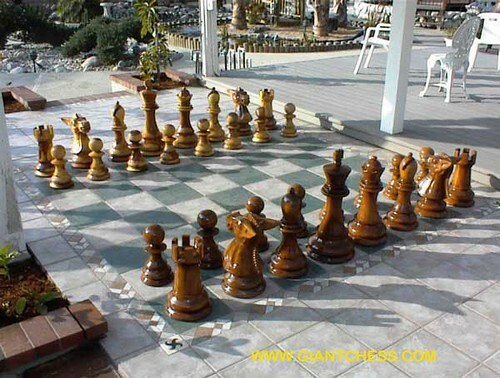 Those chess pieces put on squares floor at outdoor area. You just need to save the chess pieces without the board. You can use your squares floor as chess board, but the weak one is you cannot move it to other place. If you use the squares floor at your patio area, you can play the game only at your patio area. Chess is an exciting game for some people because there is a lot of action involved on the board while non-players just see two people brooding over wooden pieces. Children and adolescents especially love this outdoor game, and they are still not too large, nor too heavy, to be taken with you wherever you should wish to play. Even if kept permanently outdoors, in yard or garden, because they are of teak they can withstand any weather.